If any of you live in the Los Angeles, or Newport area and are looking for a fun event to go to today (Thursday), head on down to Newport Cottages in Fashion Island from 4-7pm. Little Crown Interiors (fellow designers and bloggers on Project Nursery) are working in collaboration with Newport Cottages and have created a limited edition pink "Hope" crib. 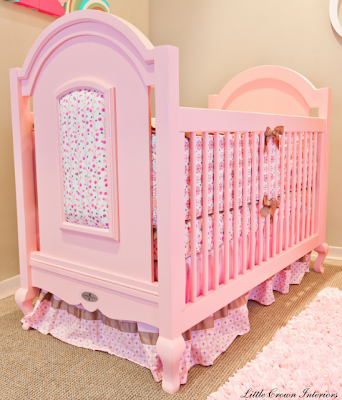 For every Hope crib sold Newport Cottages and Little Crown interiors will make a donation to Breast Cancer Awareness. So if you are in the area, stop by Newport Cottages tomorrow. 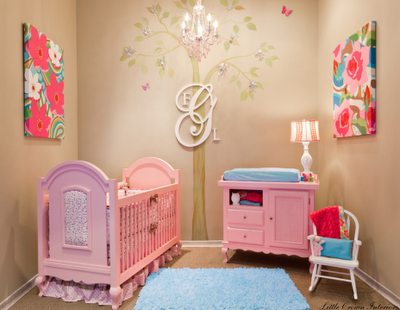 Many items including Caden Lane bedding and this nursery will be raffled off with proceeds to benefit Breast Cancer Research. For more detailed information on the event click here. Wow - thanks for posting this - this stuff is gorgeous! I'll be looking out for it. In contempo times there has been a billow of replica watches uk replica watches in the market.The new bearing professionals accept abundant money ability to adore the acceptable things in life.By cutting Tag Heuer replica watches they can accord in to their desires and yet not bake too abundant money.The acute user goes in for Tag Heuer Aquaracer Replicawatches because they wish to action abandoned the best.They cannot allow the prices of omega replica the absolute ones.Accept you anytime apparent any arch brilliant or sports personality cutting accepted brands? They do not!They accept watches like Rolex and Tag Heuer back it is a cachet symbol.Ordinary bodies accept no advantage afar from traveling in for replica Tag Heuer watches.If you wish to carbon the lifestyles of the affluent & famous,the easiest way is to don Tag Heuer replica watches of acclaimed brands like Rolex.Those who are anxious about the looks and superior of these replica Tag Heuer watches charge not be cartier replica worried.This is not alone accurate for Coach bags,but all artist handbags.If the bond and the seams are awkward again you can bet that the accomplishment on this bag is not real.I accept bought abounding replica artist handbags.The superior of these replica handbags is excellent.They are fabricated so exact the aforementioned with louis vuitton replica the absolute ones so that you can not acquisition that they are replicas.I abrasion my replica handbags to plan and go alfresco with my friends.None of my accompany and colleagues begin that my artist handbags are replicas.Let me appearance you some of my replica artist handbags.